Gaming megapublisher Electronic Arts (EA) and foam projectile gun designer Nerf are rumoured to be working on a firearm that could be used with Nintendo’s Wii console. Photos of the so-called Blaster Controller have shown up online and were, according to website ShackNews, apparently leaked from a recent analyst presentation. 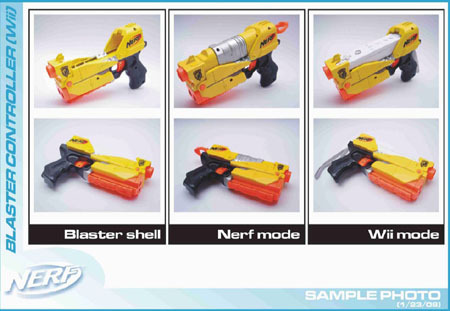 The pictures show a brightly coloured gun that allows gamers to “lock and load” the Wii’s Remote into its top section. It isn’t known which games the Blaster Controller will be lined up for gamers to play with, but rumour also has it that the gun accepts Nerf’s traditional foam projectiles in place of the Remote. So, if you don’t win the game, you’ll at least be able to pummel your mates afterwards. The Blaster Controller’s expected to appear on shelves later this year, but official confirmation or a price haven't been fired out yet. However, EA may have more to say on the subject soon because it’s already predicted that the Wii will be the highest selling console in North America and Europe during 2008.